The festive season may be over, but the celebrations never stop in Scotland. From the annual knees-up to celebrate the national Bard, Burns Night on 25 January; to stargazing in Dumfries and Galloway and chilling out in an ice hotel in the Cairngorms, Scotland is the only place to be to kick off 2018 in style. What day of the year combines haggis, whisky and poetry with lots of fun and laughter? 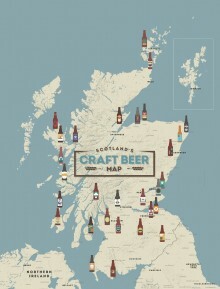 Burns Night of course, and Scotland is the best place to celebrate. Burns Night marks the anniversary of Robert Burns’ birth on 25 January each year. Take a look at our Hold you own Burns Supper eBookto find hints and tips to help create a memorable Burns supper, including suggested readings and a running order detailing all the essential elements of a traditional celebration. Stars from across the country congregate as Dumfries celebrates the birth of the Bard with a vast selection of dance, theatre, visual arts, live art and comedy, turning Burns Night into a festival of contemporary arts. The Ghillie Dhu will be hosting a truly spectacular and traditional Robert Burns experience. The haggis will be traditionally piped into the room, with a Robert Burns reading and the traditional toast. Throughout dinner there will be live Scottish Folk music. After dinner, immerse yourself in a live ceilidh and dance the night away. Glasgow’s annual folk, roots and world music festival, Celtic Connections celebrates its 25th Anniversary in 2018 and will showcase Celtic music and its connections to cultures across the globe. From 18 January – 4 February 2018, 2,100 musicians from around the world will descend on Glasgow and bring the city to life for 18 days of concerts, ceilidhs, talks, art exhibitions, workshops, and free events. 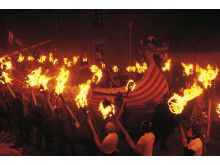 Britain's biggest and most spectacular fire festival takes place in Lerwick on the last Tuesday of every January. Featuring a torch-lit parade of almost 1000 people, dressed either as Vikings or in all manner of crazy fancy-dress costumes, the spectacular burning of a Viking galley, ceilidhs and all-night partying, Up-Helly-Aa is guaranteed to brighten up the January gloom. Whether choosing to hear the cheerful chirp of a dawn chorus, seeing a graceful soaring white-tailed sea eagle, or sailing alongside playful dolphins, there are incredible opportunities to get up close and personal with the wildest of our residents.One of the best ways to see creatures in their natural habitat is to head out with the experts on a wildlife tour. Take a coastal boat trip, head off-road in a 4x4 on a wildlife safari, or make a break of it on a wildlife holiday. You can even go on a nocturnal tour and see wildlife under the cloak of night using high-tech thermal and night-vision equipment. Scotland has some of the darkest skies in Europe and Galloway Forest Park is one of the darkest places in Scotland, which is why it’s the UK’s first Dark Sky Park. So few people live within the Forest Park that the nights really are inky black, making it a brilliant place to enjoy the stars. Rosnes Bench is an idea developed for the vast and diverse landscape of Dumfries and Galloway by Scottish artists Dalziel + Scullion. The benches slow you down, create stillness, change your viewpoint and help you to remain in the moment. The aurora borealis can be seen anywhere in Scotland when the right conditions are met and where the light pollution is at a minimum. Some locations where you have the best chance of seeing the Northern Lights are Shetland, Orkney, and Rannoch Moor. With no roads in or out, an 18 mile hike over Munros or a seven mile sea crossing to reach it, this pub is the most remote on mainland Britain (Guinness Book of Records). The Old Forge in the village of Inverie, Knoydart, started out as a smiddy’s forge. Later, seeing better use as a workers’ social club where it grew up and became a pub. The Old Forge is now offering five new deluxe rooms (for two to four people) in the Knoydart Snugs on a dinner, bed & self-catering Breakfast basis. A Knoydart Snug is a wee comfortable deluxe accommodation situated in The Old Byre premises with independent access. Set in magnificent Scottish scenery; hills, lochs, rivers and forests abound. The eco-friendly get-away is totally off-grid. Powered by a hydro turbine and a large bank of solar panels.The ecoYoga Centre has 13 bedrooms. The main accommodation area has ten bedrooms with luxurious super kingsized beds, a sofa and table in a sunny windowed lobby, or views to the river. In the glazed studio, overlooking the gorge of the River Liever, you can learn the art of Yoga from some of the finest Yoga teachers in the world. Fancy sleeping in a self-built ice room? Then book an exhilarating trip which combines guided winter mountain walking and an overnight stay in a snow hole. Experience it with the likes of Scot Mountain Holidays, based near Aviemore, for the adventure of a lifetime in the beautiful snowy Cairngorms. Curling is on the list of the many great things that the Scots have invented. There are curling clubs at ice rinks across the country, from Dumfries in the south to Elgin in the Highlands. Sometimes, when a cold spell hits and lochs and ponds freeze over, curling is played outdoors. Why not get started by finding a taster session? You might be surprised to know that there is quite the sled dog racing scene in Scotland, with popular rallies taking place in the winter months - Aviemore is even home to a designated centre for the sport. You can meet these hardworking canines at the kennels and sled dog museum or book a sled dog safari, training session or course with the Cairngorm Sleddog Centre. Established in 1956 Glencoe is Scotland's oldest Ski centre and has a reputation as being a great venue for the more experienced skier. With stunning scenery and a great choice of runs including the famous 'flypaper' (The UK's steepest black run) Glencoe is a must visit destination for the more experienced skier and snowboarder. CairnGorm Mountain has a reputation as one of the most beautiful - and sometimes challenging - places to ski in the UK, as well as boasting Scotland's only funicular railway. 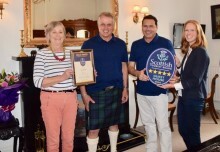 It's also Scotland's most popular resort and is located just a short distance from the main A9 arterial route which runs between Perth and Inverness. Whether you're a skier or not, the ride on the train to the Ptarmigan Top Station is a unique experience with an opportunity to take in fantastic panoramic views of the surrounding area. For more information on holidays in Scotland, please go to www.visitscotland.com.